Marke Raines first went on radio more than 50 years ago. He slammed a book shut as a sound effect during a radio drama at CFCN, the sound meant to represent the angry closing of a door. He was in Grade 6. Marke's experience since has been somewhat more varied and exciting. He was, for example, the first full-time beat reporter in Vancouver radio. But his route to that job was rocky. "I had a lisp and was nasal. So I taped myself and really listened to my voice and I cured it. In 1951 I came to CKMO Vancouver. I was in the newsroom, and doing some copywriting. CKNW was looking for a copy writer, but I had no interest at all in moving. Then Norm Pringle, the productions manager, says, 'Eunice Hoffman's there.' I said , 'Is that the girl you once said just the one for me?' It was and he was right. Eunice was working in the NW copy department. So I went to CKNW. Bill Rea thought I'd been just a writer, then heard me on air at CKMO. 'Oh, you're an announcer, too.' He sweetened his offer, he liked all-round people. I started in January, 1952. I'd hop the interurban to get out there. So now I'm half in the news department, half in copy." "Eunice and I were married June 14, 1952." (A coincidence, Eunice had once worked as a reporter for the Edmonton Bulletin. Bill Rea's last employer before he got into radio. Her own radio experience was varied: she'd been at CFRN, CJCJ and CFRB.) With Jim Cox's help, Marke got into the NW newsroom full-time. "Everything I ever knew about news I got from Bill Rea and Jim Cox. "After I was there about 2 years, Rea got an idea: a beat man, someone who went out in a news car and covered stories out there. That was a new ideas in 1954. 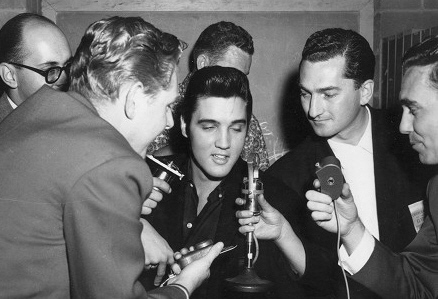 So they sent me out in my '48 Plymouth, and I became the first beat reporter in Vancouver radio." Marke Raines was a CKNW news "beater" for 10 years. He and CKNW made another step into the future when he got a car phone, and he used it to call in some stories.